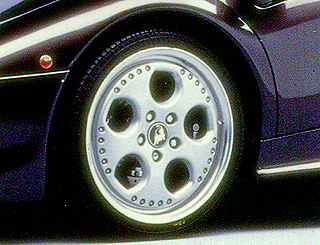 Introduced at the 1993 Geneva Motor Show in March. In the tradition of manufacturing extraordinary grand touring automobiles, Automobili Lamborghini once again demonstrated that pairing old-world hand craftsmanship with state-of-the-art engineering technology delivers world-class results. The latest testament out of the Sant'Agata facility is the Lamborghini Diablo VT. The magnificent Diablo (so named after the legendary and ferocious fighting bull that fought an epic battle in Madrid in 1869) is continuously refined each year since its introduction in 1990. The major reengineering that occurred for the 1994 model year, where more than 25 percent of the 6,000 components were modified, has been carried over to 1995. The 1995 Lamborghini Diablo VT features two new significant improvements to enhance driver and passenger comfort - a lighter clutch and deeper, wider seats. Through the use of hydraulics, Lamborghini engineers have completely redesigned the clutch, greatly improving its performance, reliability and movement. Drivers immediately notice how effortless it is to depress and release it for everyday driving situations. "This clutch is in stark contrast to what drivers of exotic automobiles have had to contend with in the past," stated Gianfranco Venturelli, general manager of Automobili Lamborghini S.p.A. "Lamborghini owners will never have to settle for second best." Cabin comfort and roominess is enhanced by redesigned seats that are deeper and wider, resulting in increased headroom. The all-leather seats also provide greater lateral support and comfort. The distinguishing technological trait of the Diablo VT is its use of an original variable four-wheel traction system. The Viscous Traction (VT) feature increases the performance in conditions of low ground adherence which would normally render the vehicle less efficient with only rear-wheel drive capabilities. Based on the relationship between the grip and torque, when the rear wheels begin to spin, up to a maximum of 40 percent of surplus torque is automatically transferred to the front axle. This allows the Diablo VT to maintain its classic, traditional rear powertrain performance, but adds the ability to instantly transform itself into a variable all-wheel drive when the rear-wheel drive alone reaches its natural limits of adherence. This also greatly reduces the tendency to oversteer when cornering at high speeds, a characteristic of most rear-wheel drive vehicles. The Diablo VT's handling ease is credited to its fully independent active suspension and powered rack and pinion steering. Fully adjustable, the active suspension when engaged in the automatic mode is governed completely by the vehicle's speed. The damping program is chosen automatically from predetermined maps based on tests involving varying road conditions. In manual mode, the driver can choose his preferred ride from among one of four settings by a convenient console-mounted switch. Naturally, safety aspects take priority. If the driver selects a "soft ride" program but exceeds acceptable programmed speeds, the computer will automatically adopt a stiffer, more sporty program for the increased performance. This remains inserted until the speed is reduced to corresponding levels at which point the originally chosen ride is readopted. Power-assisted steering, an uncommon feature in high performance sports cars, also significantly improves handling and driver comfort without sacrificing safety. Its action is also speed sensitive so that the steering is "hardened" as speed increases. This offers the driver maximum sensitivity and precise control at higher speeds, yet will allow light and easy maneuverability at lower speeds. 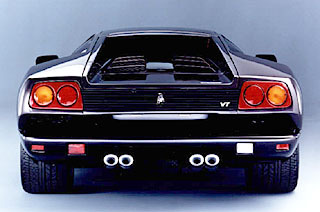 Designed by Marcello Gandini (he also designed the Miura and Countach), the Diablo VT's body is comprised of strong aluminum alloys and a liberal use of carbon fiber composites. The engine cover, transmission tunnel, front decklid, rocker panels, bumpers and front and rear spoilers are made of the lightweight carbon fiber material. As with all Diablos, the generous 5.7-liter, 48-valve, 492-horsepower V-12 engine bellows its acceptance when asked to do so. 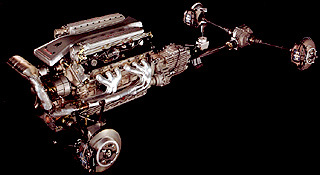 Lamborghini's sculpted powerplant sits mid-longitudinally and generates 428 lb./ft. of torque at 5200 rpm. 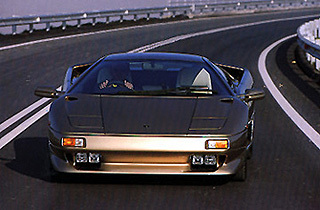 The Diablo VT has a recorded top speed of 201.9 mph and 0 - 60 mph times of 4.09 seconds. To control speeds, special Brembo high performance racing brakes, featuring light alloy calipers, are standard. Ensuring a smooth and safe ride at all speeds, the Diablo VT is equipped with 200+ mph-rated Pirelli P-Zero tires mounted on custom-designed 17-inch aluminum alloy OZ wheels. The high-grade all-leather cabin is highlighted by its attention to driver detail. The classic dog-leg gate serves as the centerpiece among such standard luxury appointments as full-time active climate control, Alpine AM/FM stereo/cassette, power windows, tilt adjustable steering wheel, power mirrors and central locking system. "The Diablo VT continues to serve as the benchmark of the exotic sports car class, garnering accolades from all who experience it," said Robert A. Braner, president and COO of Automobili Lamborghini USA, who added that, "in terms of performance, aesthetic qualities and in driver friendliness, the Diablo VT is unparalleled." The 1995 Lamborghini Diablo VT had an MSRP of $239,000 US.